Sakichi Toyoda was born in Japan 145 years ago today on February 14th, 1867. By all accounts a hard-working entrepreneur, Toyoda's greatest success was building a small business manufacturing textile looms. That business ended up growing into a company that, for two years beginning in 2008, became the world's largest automaker. That company is named Toyota. We've always wondered: Why the change from "d" to "t"? NOTE: As we pointed out earlier, today's the 145th anniversary of the birth of Sakichi Toyoda, the patriarch and founder of the textile machinery company that became Toyota Motor Company. To celebrate this anniversary of the number one super best automaker from the land of the rising sun, we've cleaned up this blast from our past by Sam Smith. The article was originally published on February 24th, 2010 at 4:00 PM EST. —Ed. 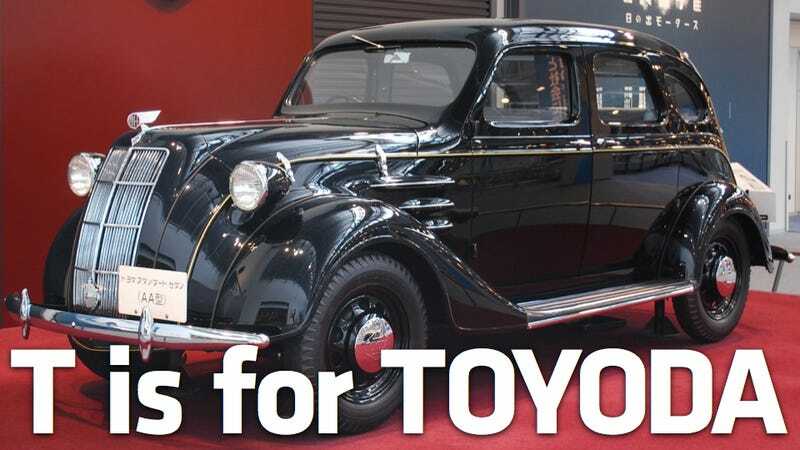 In 1936, when Kiichiro Toyoda, Sakichi's son, decided to start building cars, he needed a name for his new venture. Since the business created by his father in 1926 was humbly named Toyoda Automatic Loom Works Ltd., and since he was shifting resources from that company to his new venture, he decided to name his car company in the same fashion. Next, in order to drum up publicity, Toyoda held a contest to establish a logo for his new venture. Twenty-seven thousand people answered the call. The winning design consisted of the word "Toyota" — no "d" — depicted in a stylized form of the Japanese katakana alphabet. The Model AA, shown above, was Toyota's first passenger car, and it became the first car to bear the new name and logo. The change had a few advantages: "Toyota" offers a softer final syllable than "Toyoda," and it rolls off the tongue better for us 'mericans. Writing it in katakana takes eight brushstrokes instead of the d-word's ten, which was also fortuitous — eight is considered a lucky number in Japan, and the character's shape symbolizes future growth and prosperity. A theory also exists that the adjusted spelling served to insulate the car company from the loom manufacturer; if the car firm were to have failed, the thinking goes, the older corporation would have avoided damage. Lastly, the new name represented a convenient break from Japan's agricultural past: "Toyoda" means "fertile rice fields" in Japanese. Although the original logo was gradually phased out of export use — American-market Toyotas moved to a simple, roman-type badge and then a stylized "T" — it was retained for the Japanese market. It still adorns the Toyota Motor Company's head office in Aichi. This post was originally published on February 24th, 2010 at 4:00 PM EST.